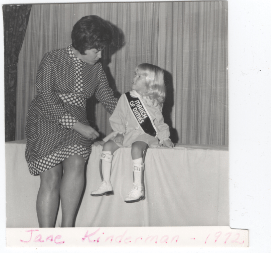 Since that modest start over 60 years ago, Tri Sigma has granted over 3 million dollars to continue the work of Sigmas Serving Children. Beginning June 2016, we expand Sigma Serves Children to form a national partnership with March of Dimes. 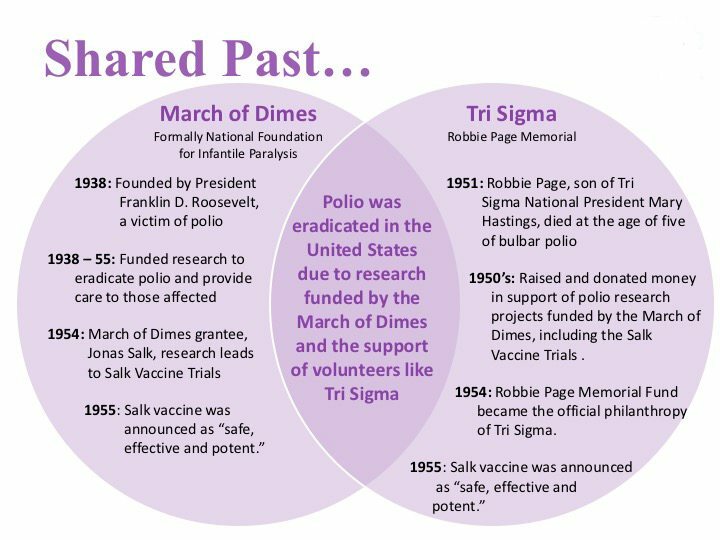 From polio to prematurity the March of Dimes and Tri Sigma have a shared vision of Serving Children by focusing on research and prevention. To compliment the continued success of the Robbie Page Memorial Fund, a committee was appointed in 2014 to identify a national philanthropic partner. The shared history of both Robbie Page Memorial and March of Dimes aligned our efforts to enhance children’s health. Having March of Dimes as an additional philanthropic partner gives Tri Sigma’s across the United States a natural opportunity for engagement within their own community – something our membership has been requesting for over a decade. With prematurity being the #1 killer of babies in the United States, Tri Sigma stands with March of Dimes in the fight to help more moms have full-term pregnancies and healthy babies. This partnership provides us a valuable opportunity to expand the work we began in 1951, and continue our mission of Sigmas Serving Children. With the current impact Tri Sigma makes through Sigma Serves Children, we will make even more of an impact on our members, campuses and communities. In just one year, 4 million babies benefited from March of Dimes research, vaccines, education and breakthroughs. 90,000 families with a newborn in intensive care were offered comfort and education through the NICU Family Support program offered through March of Dimes. 2.1 million moms, dads and health professionals received community services and education to improve babies’ health. Discover more about March of Dimes. The future of the Foundation is being built with the future of our members in mind. Our vision guides us to build a Foundation where our members can emotionally and directly engage with our philanthropic efforts. For more information on partnering with the Tri Sigma Foundation, contact Executive Director Meghan Ward Bopp Paden at mpaden@trisigma.org.